A gritty 98 from Laurie Evans, coupled with a spirited lower-order onslaught from Jeetan Patel and Keith Barker, enabled Warwickshire to enjoy the better of another gloomy day at Lord's. They converted their overnight 148 for 3 to a competitive 342 - not bad at all after being asked to bat first - before Chris Wright nipped in with the early wicket of Joe Burns as Middlesex weathered the new ball to reach 39 for 1 in reply. In what has so far been a stop-start contest, the true value of the runs that Warwickshire have put on the board will only be known when Middlesex's own innings has developed further. However, the hostile reception that Wright and Barker doled out with the new ball suggests that life isn't about to get too much easier for batting. "There's a bit of variable bounce in places," Evans said. "You don't mind left to right [movement] so much but when it starts to go up and down, it's a bit tricky and can get in your head. We realised it was tricky to score so we decided to be positive. I can't see it getting any better to bat on, but we were looking at around 220 to 250 after being put in, so it's a great effort by everyone on a scrap-hard wicket." Both of Middlesex's not-out batsmen, Sam Robson and Nick Compton, were rapped on the gloves by lifters from a good length in a final session that was twice interrupted by bad light before the weather closed in for good shortly after 5pm. 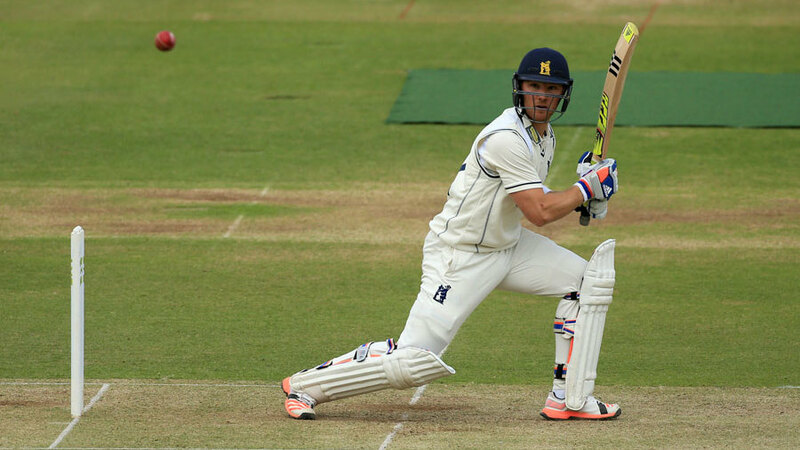 Warwickshire had resumed in the morning with Evans and Jonathan Trott unbeaten in a 92-run stand for the fourth wicket. However, Trott managed to add just a single to his overnight 44, as he nibbled outside off to Toby Roland-Jones and feathered a thin edge to John Simpson behind the stumps. Tim Ambrose, the new batsman, had two moments of good fortune when he spliced a lifter from Roland-Jones over the slip cordon on 2 before edging inches short of Ollie Rayner at second slip on 10. But his luck ran out on 20 as Neil Dexter entered the attack for Rayner to hold on to an attempted uppercut over the cordon. However, Evans ground on undaunted, inching ever closer to what would have been his fifth first-class century with an innings that was never fluent but didn't want for composure. He rode his luck outside off stump (or was it good judgement?) and seemed to have shrugged off his role in the run-out of Rikki Clarke for 15 when Steven Finn, returning from the Pavilion End, beat him with a nip-backer that flicked his pad and crashed into the stumps to leave him stranded two short of his hundred. "It was nice to spend a bit of time at a great ground. It was a shame not to get a couple of runs but I could have been out at any stage, it was that sort of wicket. I was just glad to get a score." At 253 for 7, Middlesex sensed their chance to steal the ascendancy, but they reckoned without the obduracy of Barker and Patel, who saw off the seamers then took on the spin of Rayner, who was dumped over the leg side for four sixes in his first 13 balls before striking with his 15th to have Patel lbw for 37 and end a momentum-seizing eighth-wicket stand of 72. The end of Warwickshire's innings came in a relative rush. Barker was trapped on the crease by Roland-Jones and bowled for 37 before Boyd Rankin departed in the same fashion five overs later, aiming a massive mow at Rayner. Robson, in reply, eased Barker through the covers for a second-ball four before Burns went one better with a spanking pull from Wright's opening delivery. But Wright struck back in the same over, trapping Burns lbw for 4 to set up a testing evening session. Robson and Compton prevailed in the gloom, however, with Robson, in particular, finding some fluency to pick off five fours in his unbeaten 26 by the close. "There's definitely enough still in the wicket," Evans said. "We'll be looking to pitch the ball up and get the slips in play."